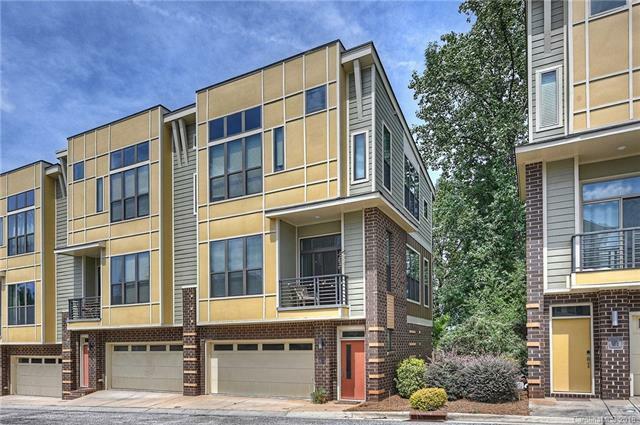 Highly sought after END UNIT located in Noda's popular Steel Gardens community just minutes from uptown Charlotte. Walk to restaurants, coffee shops, breweries, parks, music venues, and the brand new LIGHT RAIL. This open floor plan features an abundance of natural light, high ceilings, hardwood floors, granite countertops, large kitchen island, and stainless steel appliances. Large master suite has 12 foot ceilings, walk-in closet plus 2nd closet, and spacious master bath with dual sinks. The tranquil fenced private rear patio backs up to a tree line and is perfect for outdoor entertaining or relaxing. Kitchen refrigerator and washer/dryer convey. HOA dues include Spectrum cable TV & high speed internet, water, sewer and trash. Location, Location, location!